I ventured to Abu Dhabi to check out the city's newest art fair--Abu Dhabi Art-- for Monocle. It was, as expected, a blockbuster event that attracted some of the finest galleries in the world. It seemed most were interested in helping the city stock their new museums (the impending Louvre and the Guggenheim). 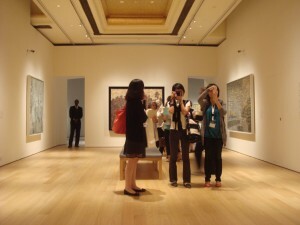 Images here from the Guggenheim's exhibit at Emirates Palace entitled Making of a Museum.